Barack Obama has been elected the 44th American president! I'm watching John McCain's concession speech now, and I'm even proud of him. His speech is a good one, although his supporters are a bit creepy. For the rest of the night, I'll be keeping my eye on California's Prop 8 and the rest of the state ballot measures banning gay marriage, gay adoption, gay... people. It's not looking good, folks. I'm now officially double majoring in Political Economy and American Musical Culture! This is exciting for me, because now I can legitimately say music is more than my hobby. Writing cover letters for music and entertainment industry jobs will hopefully be less difficult to swing this spring. 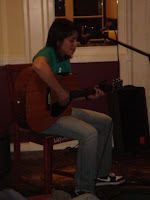 Also, I played one of my songs this past Wednesday at an Open Mic Night. I still remember crying in the 6th grade after my saxophone teacher forced me to play a duet from Aladdin with some older kid during my lesson at The Music Tree, so it looks like I've come a long way in social development. Lots of friends showed up to support me, and I felt especially loved that night. Finally, I've been to a slew of really great concerts. Ben Kweller played Rock 'n Roll Hotel on Oct. 21; The Magnetic Fields played GWU's Lisner Auditorium Oct. 26; and I just saw Amos Lee at 9:30 Club last night. It was my third time seeing Ben Kweller and his indie twang style suited my lazy mood for the night. Old favorites were twangified, although noticeably absent was "Wasted and Ready." I'm looking forward to his new album Changing Horses set for February release. The Magnetic Fields were absolutely amazing, and I felt so fortunate that DC was on their curiously eccentric October tour. I loved every song they played, including old favorites "I Don't Believe You" and "Yeah! Oh Yeah!" and new favorite "Drive On, Driver." Lastly, I saw Amos Lee yesterday. He played a solid hour-and-a-half set including almost every song from his self-titled debut. His new material is great! It's what I like to call Sunday music for reclining and relaxing. Mmm. Alright. I've gone on too long, but I will try to post more frequently in next few weeks. I think I'll post about my exciting Patagonia gear soon. I definitely have immense brand loyalty from this job. Happy Election Day! I'm relieved that the world will wake up to Barack Obama as the winner.